Present at the award presentation were (l-r) Ross Brooke Watts, Whitworth University; Cassandra Gulam, WSU Vancouver; Melanie Brown, WSU Pullman; and Patricia Chantrill, Eastern Washington University. 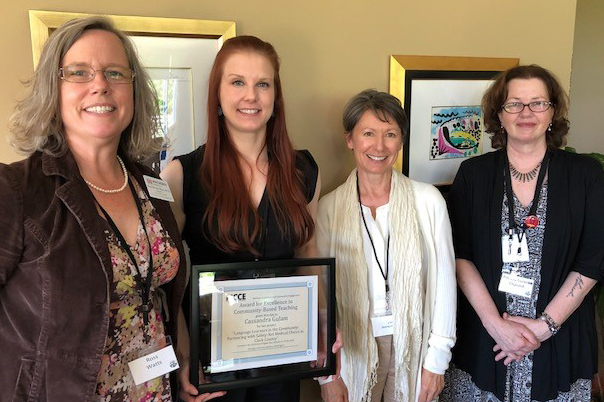 VANCOUVER, Wash. – Cassandra Gulam, a senior instructor of Spanish language and culture at WSU Vancouver, recently was recognized at the Community Engagement Institute at Gonzaga University. Overall, Gulam’s work modeled the kind of reciprocity that reviewers desired to see practiced between folks in higher education and the community. Gulam is a member of the Teaching Academy and a Community Engagement Faculty Fellow. Melanie Brown, director, Center for Civic Engagement, 509-335-5401, melanieb@wsu.edu.